Dungeons & Dragons Dice Masters: Battle for Faerûn is a game that utilizes WizKids Games' proprietary Dice Building Game platform in which two players take the role of warlords, collect and assemble their "party" of adventurer dice and battle in head-to-head gameplay. Each turn, players roll the dice to see what resources they have available, buy dice, send their party members into the field, and then strike at the enemy warlord. There are multiple cards available for each type of die so players get to choose which one to use. This lets players specialize dice to suit play style. Additional cards and dice to expand your collection can be found in expansion packs. 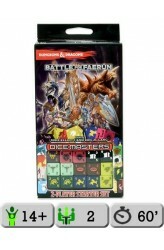 Each Foil Pack contains two cards and two dice that players can add to their Dice Masters Battle for Faerûn collectio.. In the Dungeons & Dragons: Temple of Elemental Evil Board Game, you play as a heroic adventurer. With amazing abilities, spells and magic weapons, you must explore the dungeons beneath the Sword Coast where you will fight monsters, overcome hazards and find treasure. Are you ready for adventure? 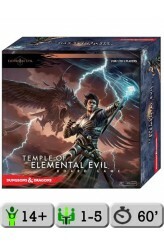 Temple of Elemental Evil includes multiple scenarios, challenging quests, and co-operative game play designed for 1-5 players. The contents can also be combined with other D&D Adventure System Cooperative play board games, including The Legend of Drizzt and Castle Ravenloft. Each player selects a hero, such as a fighter, cleric, or wizard. On their turn, each player can explore further into the dungeon (turn over new tiles), move through the already explored parts of the dungeon,..
As ruler, it's up to you to build the mightiest realm in the world! Will you choose to follow military tactics and sweep away all in your path with a massive army? Will you turn towards sorcery and control an inaccessible island surrounded by impenetrable flames? 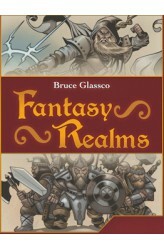 The choice is yours, and no two realms will ever be the same in Fantasy Realms, a combo-licious card game. Fantasy Realms takes seconds to learn: Draw a card, discard a card — though you can draw from the deck or the discard area! Make the best hand you can by making the best combos. The game ends when ten cards are in the discard area. Aim for the highest score to win! 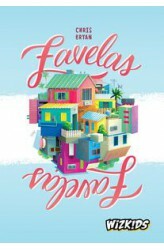 https://www.youtube.com/watch?v=WKLjQHtluss ..
Favelas is a tile-laying game about the beautification of the iconic favelas of Rio de Janeiro! These stacked and ever-evolving neighborhoods are home to many people who stand to benefit greatly from this infusion of money, modernization, and beauty. The bad news is that the council who will approve the funding is fickle and constantly coming back with notes which alter the value of the colors that are used in this beautification. Played over three rounds, this fast-moving Euro-style game will keep people watching for the majorities their opponents are going for — and which colors are being devalued or not. https://www.youtube.com/watch?v=ps3JC7XkXRA .. 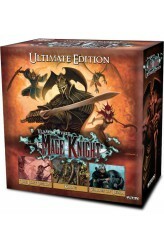 The Mage Knight board game puts you in control of one of four powerful Mage Knights as you explore (and conquer) a corner of the Mage Knight universe under the control of the Atlantean Empire. Build your army, fill your deck with powerful spells and actions, explore caves and dungeons, and eventually conquer powerful cities controlled by this once-great faction! In competitive scenarios, opposing players may be powerful allies, but only one will be able to claim the land as their own. In cooperative scenarios, the players win or lose as a group. Solo rules are also included. 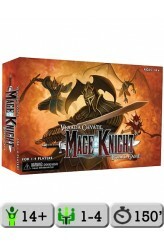 Combining elements of RPGs, deckbuilding, and traditional board games the Mage Knight board game captures the rich history of the Mage Knight universe in a self-contained gaming experience.. https://www.yout..
Krang is here! Let Chaos reign! 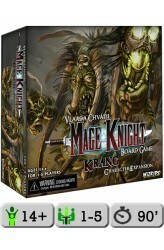 The Mage Knight Board Game: Krang Character Expansion includes all that players need to add Krang, the mysterious and dangerous Orc Chaos Shaman, as a new playable character to the Mage Knight Board Game, including his prepainted miniature, unique starting cards, and skill tokens. 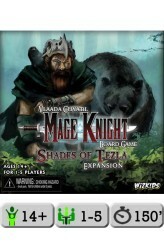 ..
Mage Knight Board Game: Shades of Tezla Expansion is the third expansion to Vlaada Chvátil's critically acclaimed epic fantasy hit of 2011! Battle against two factions as they war for control of the legacy of the Wizard Tezla. Step into the shoes of an all new Mage Knight, the Storm Druid Braevalar, as he emerges from the forest to bring an end to the destruction caused by the war between the Avatars of Tezla. https://youtu.be/FNT9Kkgl5uA .. Stories about General Volkare and his Lost Legion are whispered amongst the Atlanteans – some in hope, all with at least a sliver of fear. Now with word of what appears to be Volkare and his Lost Legion reappearing and yet another new Mage Knight to contend with, the scattered forces across the land are deciding which side is likely to be victorious. Are the Mage Knights the lesser of evils, or is Volkare the true savior they have been waiting for? 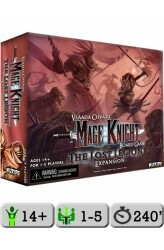 Continuing the saga of the worldwide acclaimed hit Mage Knight Board Game, designer Vlaada Chvatil and WizKids present Mage Knight Board Game: The Lost Legion, an expansion that offers players a new Mage Knight — Wolfhawk — and also adds a new foe for the Mage Knights: the mysterious and powerful General Volkare! Included in th.. Combining elements of RPGs, deck-building, and traditional board games, the Mage Knight Board Game puts you in control of one of four powerful Mage Knights as you explore (and conquer) a corner of the Mage Knight universe under the control of the Atlantean Empire. Build your army, fill your deck with powerful spells and actions, explore caves and dungeons, and eventually conquer powerful cities controlled by this once-great faction! In competitive scenarios, opposing players may be powerful allies, but only one will be able to claim the land as their own. In cooperative scenarios, the players win or lose as a group. Solo rules are also included. 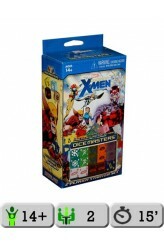 Mage Knight: Ultimate Edition contains the base game; The Lost Legion, Shades of Tezla, and Krang C..
Marvel Dice Masters: Uncanny X-Men is a collectible dice-building tabletop game designed by Quarriors! creators Michael Elliott and Eric M. Lang. 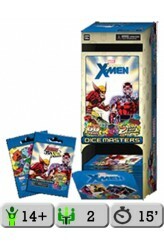 In this game — which features Wolverine, Magneto, Cyclops, Iceman, Psylocke, the Sentinels and more — each player fields a superhero team, with each hero being represented by custom-tooled dice; each team must be composed of 15 dice, and a player can "purchase" dice only from his team. Each hero also has one or more character reference cards, which show the special abilities for the characters based on the die rolls. Different versions of these cards will be available in booster packs, allowing for more customization of your team. Players use these dice to collect energy, recruit new heroes, and battle head-to-head. 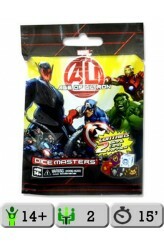 In addition, each playe..
Marvel Dice Masters: Age of Ultron is a collectible dice-building tabletop game designed by Quarriors! creators Michael Elliott and Eric M. Lang. In this game, each player fields one of the superhero teams, with each hero — Rocket Raccoon, Groot, Captain Marvel, Daredevil, Kang and more — being represented by custom-tooled dice; each team must be composed of 15 dice, and a player can "purchase" dice only from his team. Each hero also has one or more character reference cards, which show the special abilities for the characters based on the die rolls. Different versions of these cards will be available in booster packs, allowing for more customization of your team. Players use these dice to collect energy, recruit new heroes, and battle head-to-head. In addition, each player brings t..